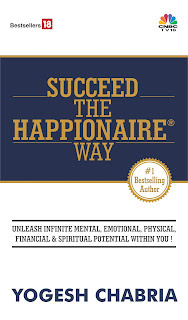 Yogesh Chabria - The Happionaire ​Blog - Best Motivational Speakers In India - Inspiration, Success: NRIs Are Not Fools! I find it strange when economists, builders, bankers and politicians behave as if NRIs are fools and can easily be taken for a ride. What got me upset was that recently at a conference in Delhi, we had an economist saying how NRIs need to be taxed in India and that money needs to be used to help the poor. Helping the poor is good – but shouldn’t we instead be taxing our politicians extra? I’m sure a little bit of tax wouldn’t hurt them. Instead of putting taxes for NRIs, we need to reduce taxes even for resident Indians and ensure that our bureaucrats are taught how to spend money efficiently. Tax reduction is fact will increase the money the government earns in the longer run. Tax reduction will put more money in the hands of people, which they can use to invest and spend. This will create new employment and opportunities and thus reduce poverty. Charity doesn’t reduce poverty – opportunities and investment do. At a time in India tax rates were 98% - were those taxes helping the poor in any way? It just made a lot more people poorer. The best way to reduce poverty is to increase wealth. NRIs are already made to pay heavy taxes in their respective countries or work/residence. In addition to this, if they are to also pay taxes back home in India, they will simply stop sending money back home. The problem with these economists is that they never think about the practical aspects of life. They are simply following theoretical knowledge printed in books. A hard working man leaves his home in search of work abroad, should he be punished even more for it? Have they forgotten that NRIs are amongst the people most faithful to India and regularly send money back home? We should instead ensure that we stand up for them, when they are faced with discrimination, racism and security threats. Our government should threaten action against governments that are not stopping racism and discrimination. Look at what is happening in Australia. Our government is too soft on a lot of issues internationally – if we don’t stand up for our rights, we are committing the biggest sin. In the Geeta we are taught, that the biggest sin is to tolerate injustice. If NRIs are taxed in India, they will simply stop sending money back to India or use various creative methods available. Even if they were to invest in Indian equities, they could form a company abroad and route money through Mauritius (or any other Tax Haven) and make sure it is completely tax free. Today in almost every area NRIs are being treated as fools. They are firstly getting much lower rates in an FD. For example a one year rupee FD gives them barely 3% p.a. – they might as well just keep their money in a savings bank account and earn more interest. When it comes to builders and property developers, they are always looking out for an NRI to trap and sell something even more overpriced than what they sell to a resident Indian. What is the protection available to innocent people who have invested in property and been cheated by the land mafia? Remember Khosla Ka Ghosla? Today not a single non-resident Indian will invest in property, because it is even more overpriced than property in London or New York. Just because I have Rs. 100 crores, it doesn’t mean I will buy a dilapidated building overlooking slums for Rs. 2 crores. Irrespective of whether you are an NRI or resident Indian - nobody is a fool. The great thing about us Indians is that no matter how difficult and challenging things are made for us, we always come up with ways to surpass the system. Today our fellow Indians are present across the globe, making the name of our nation proud. India is an excellent investment opportunity, all that our government needs to do is make it a little easier for NRIs to invest safely back home. They should be made to feel safe, comfortable and happy about being Indians. It would also be unfortunate that they miss investing in India, just because of a few old age economists or bureaucrats. We should ensure these people don’t interfere in our lives and our dream of building a new prosperous, confident, healthy and happy India. JAL(Japan Airlines) went bankrupt, Citi-Bank declared heavy losses, Bank of America declares losses. These are all signs that we are getting close to the start of some excellent buying opportunities. I will talk in detail on these issues and why my views on gold continue to be very positive in the coming posts. Have been busy with the launch of a new private fund. Our last post had lots of interesting discussions and a lot of stocks shared by fellow Happionaires are excellent for the next 2-3 years, but our overall policy that our main goal is to guide here and not provide tips will continue to remain. Even when I shared Indian Hotels in Cash The Crash (the stock price was around 35-40 – today it is over Rs. 100) the aim was to provide reasons behind investing and not to provide any tips. And I am sure with time; we will be able to convince each and every person wanting to invest to follow this investment style. It is a proven fact that it actually works. A refreshing point of view and something rarely spoken about. I as a doctor in London completely support this. If the government really want to get some NRI money into india, they should come with some attractive schemes that would make the NRIs confident enough to park their money here. you always come out with something new and useful in long term. i think each and every indian will support you and your thoughts. Thanks for sharing ur knowledge with ur followers. I am from Kerala where the politicians have been milking the poor Gulf Malayalees for the past 30 years. They send home, as per some estimate 50000 crores per year, most of which goes to low yieldong govt FDs. The Govt guys on tour to the Middle East routinely ensure them that they can invest in some PPP projects which everyone here know will never take off. And nobody cares about those nurses all over the world who send money home. Even in New Delhi they are not taken care of. Politicains are intersted only in Money and THEY MUST BE TAXED more. The money sent home from Middle East itself is enough to make this state a Singapore. Nobody to blame but ourselves for electing these stupids. Yogeshji this is one of the best post i have come across in recent times on your blog. I am real not surprised the way congress government has been handling this whole Australian Racism episode, anyone who is interested in tracking politics is surely not surprised, just last week I read somewhere that our government wants to improve our Bilateral ties with Australia on longterm basis and unfortunately its our People who are paying the price for this bilateral ties and I really doubt this sarkar will do anything concrete to stop this chaos. The good news is that most of the Indian students have abandoned those Road shows which organised by Australian Universities, as result of which the admissions are down by almost 50%. I was really hoping that this year in IPL, Australian cricketers will not be allowed to play or atleast there will be no bidding for them ... but I guess lately Cricket has become all about money. I completely support all those People who will not allow Aussies to play in their respective cities (Kudos ...) because its high time that we Indians starting talking/Acting tough when required. An average Indian is way to innocent to understand the games that are played from New Delhi. Now that the budget season is coming closer we are againg seeing lot of action in select few stocks in hope of disinvestments or reforms ... Yogeshji I am sure you must have observed that Last year all the Santa Claus had opened their Gift Bags right before the elections, this time around too it will be no different. Would differ on special treatment to NRI's. It is like kicking the one living within the house and giving special treatment to an outsider. i say OUTSIDER because MOST of the guys who have gone abroad to settle have done so abusing and bad mouthing India. MOST of these NRI's have very very bad opinion about India. They left India for money and not because of lack of opportunity. It really hurts/pains when you hear bad opinion from these so called NRI's about India, especially when they have spent around 20 years of initial life span in India and more so ever after gaining knowledge in India and applying it abroad. Just to clarify i am not against all NRI's as some of them have great opinion about India and there intentions are to acquire knowledge abroad and put the same to use in India. But one think for sure NRI's are far far better than politicians. But one think for sure NRI's are far far better than politicians. Infact i think you should write an article on the tax free agricultural income. Agricultural income should be tax free only upto a certain limit. Infact you have farmers earning millions every year without paying a penny in tax. Kudos to you on such an excellent post. Living in Netherlands currently, I completely agree with your viewpoints and support it. Its a terrible state of affairs in India that NRI's have to face such second hand treatment..That too in a country that so much depends on the NRI funds and remittances. Its high time that something is done about it. I have also heard that a direct tax code will be implemented from the next year where in NRI's will be taxed on a flat rate of 30%..Any comments on this? Sachin ji, let us not have this 'inside' vs. 'outsider' attitude. We are all one, and it is only politicians who pit people against each other. Since times of British this has been the dirt secret. NRIs are also Indians and would it be fair that they pay heavy taxes in UK and again in India? What will be left in the pockets? This is a good point and very important. Will like to thank Chabria ji for his kind predictions and can see market correcting. Excellent predictions Sir. Markets are behaving as you had warned us. I want to thank Chabria ji once again for sticking his neck out as always and warning us about the coming crash. I have also sent you an e-mail for the PMS, please revert back on it when you have time. How low can markets go, any indications? Let me first thank you for warning us and not getting carried away by hype. It is very much appreciated by what you are doing, please now help us find value picks for the next wave of rising.